LONDON, September 27, 2018 – Master Jun Hong Lu, the Ambassador for World Peace and spiritual teacher of 10 million followers, was presented with several awards and honours in London, UK, at a recent event held in the British Parliament. In the afternoon, in recognition of the excellence of Master Lu in the area of education, religion and philosophy on the international stage, the University of the West of Scotland awarded him the position of Lecturer in the area of Buddhism and Philosophy. At 6 p.m., Master Lu was presented with two awards in the British Parliament. 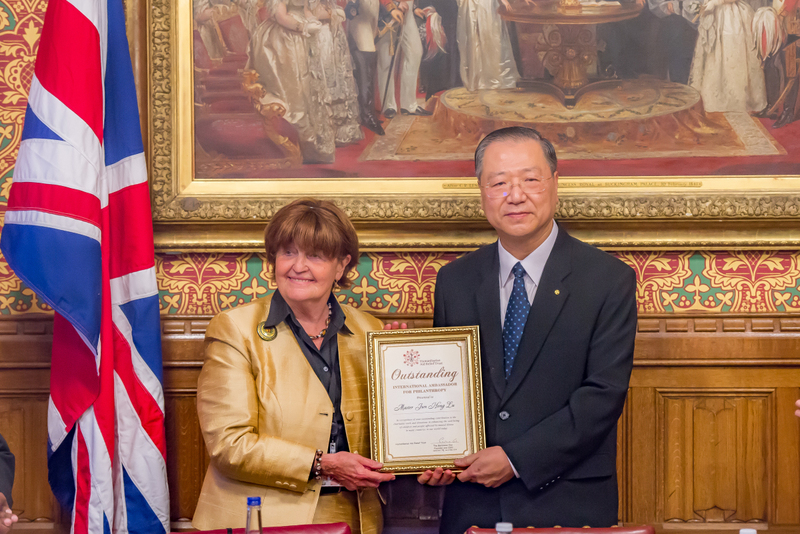 In recognition of his outstanding contribution to the harmony and peaceful exchanges among religions in many countries throughout the world, Master Lu was honoured with the title “International Ambassador for Religious Peace” by a member of the House of the Lords on behalf of the British Parliament. Furthermore, in recognition of his outstanding contribution to the charitable work and donations in enhancing the well-being of children and people affected by mental illness in many countries in our world today, Master Lu was honoured with the title “Outstanding International Ambassador for Philanthropy” by the Humanitarian Aid Relief Trust, a nonprofit organisation. Commonwealth Charity Forum took place at the House of Lords, UK. This event brought together British MPs and dignitaries from around the world. The forum features the outstanding contribution of Master Jun Hong Lu to peace and charitable work in the international community, and the honours and awards he has received over the years. Baroness Cox, the recipient of the International Mother Teresa Award, highly commended the valuable contribution of Master Lu to world peace. She said the world is fraught with war and massacre, leaving thousands of people homeless and turning them into refugees affected by diseases. Master Lu’s compassion has not only saved the suffering humanity, but he has also helped to spread the spirit of compassion to over 30 countries and regions throughout the world, purifying and sanctifying their hearts and souls. As a politician and former Minister for Foreign Affairs of Turkey, Mr Yasar Yakis was among the 80,000 people attending Master Lu’s Public Talk held in Singapore, witnessing the touching scenes where thousands of followers were moved to tears. He was amazed then by Master Lu’s prowess in moving the congregation and capturing their hearts and souls. Now he is deeply moved by Master Lu’s selfless devotion and compassion, adding that he would look up to Master Lu as his role model. Alfred Heer MP, Vice President of Parliamentary Assembly of Council of Europe, said that Master Lu, with his inner purity and affection, is able to transform the world with loving-kindness. There are personalities of different religious and cultural backgrounds in the world, but love is universal and reciprocal. He is deeply moved by Master Lu’s culture of compassion, which has affected and changed his outlook on life. He pays tribute to Master Lu for his dedication to promoting peace among humanity. Master Lu said that he has been devoted to spreading the culture of peace on his mission to propagate Buddhism throughout the world. The Guan Yin Citta Dharma Door founded by him has garnered 10 million followers and well over 30 disciples all over the world. Currently, they have over 100 practice centres and charitable organisations in more than 30 countries and regions. This is greatly attributed to the wisdom of the Chinese people and the profoundness of Buddhism. He hopes to attract more people to join ranks in the cause of promoting peace and charity. He reiterates that it is his honour and lifelong aspiration to work for world peace and that he would devote all his life to spreading the Dharma and world peace. All the participants at the forum greatly praised Master Lu’s contribution to humanity, charitable works and world peace. Just very recently, Master Lu was invited as a keynote speaker to attend the 2018 United Nations Day of Vesak Commemoration at UNESCO headquarters in Paris, France.